GaryMoller.com - Health, Fitness - Naturally! : Which personal digital blood pressure monitor is the most reliable and most accurate? Which personal digital blood pressure monitor is the most reliable and most accurate? I used to sell digital blood pressure monitors but no longer. I have used many different brands with one that has always stood out from the rest in terms of reliability and accuracy. This is the Omron brand. I have one of the early Omron wrist type machines that has given almost 10 years of daily trouble-free service. I am about to upgrade to the latest Omron. If you have a cardiovascular health issue, or a family history of cardiovascular disease, including over-weight, thyroid, poor circulation and diabetes issues, then one of the best investments you will ever make in your personal and family health, is an Omron blood pressure and heart rate monitor. Where can I purchase an Omron digital blood pressure and heart rate monitor? You can now purchase an Omron online at the official Omron website (click on the image link below to go to the Omron Store). You might want to take a look at their pedometers and body composition analysers while you are at it. Which is best: Arm Cuff type, or the Wrist type? When used in accordance with the instructions, there is little or no difference between readings between upper arm and the wrist. The upper arm machine can be awkward to fit; whereas the wrist type is a breeze to fit and operate. Therefore, there is better compliance by the patient in taking regular readings of blood pressure and pulse at home. The Omron is going to cost you a few hundred dollars with every cent well spent. 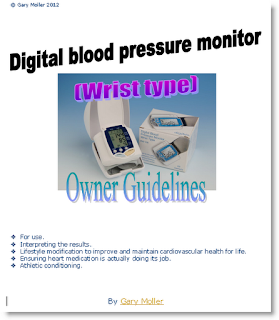 I have just completed upgrading my E-Book Guide: "Digital Blood Pressure and Heart Rate Monitor User Guidelines". Its a "must read" for you to get the most out of self-monitoring blood pressure and pulse and will only set you back a measly $10-12. It is a life-saver! Lifestyle modifications to improve and maintain cardiovascular health for life. Ensuring heart medication is actually doing its job. The advantages of monitoring your blood pressure closely when you are suffering from conditions associated with hypotension or hypertension cannot be stressed enough. It is only natural that not everybody can spend their entire time under medical supervision in clinics, so the home blood pressure monitors can really come in handy. In addition, some people suffer from a condition called "white coat syndrome", which refers to a fear of doctors.